XMLBlueprint has many features which gives you quick access to the various parts of the XML Document your are editing. The real-time Outline view (View > Outline) gives you quick access to the various parts of the XML Document you are editing. The Outline view displays the document structure of the active document. Whenever the document changes, the Outline view is updated (in a background thread), without disturbing the actual editing of the document. Click on a node to select the corresponding text in the XML Editor. You can customize the left marging by choosing which items to show. Go to Options > Editor. The Block Indicator is a gray line displayed on the right side of the margin. It indicates the lines between the start tag and the end tag of the current element. Click Options > Editor to show or hide the Block Indicator. When writing in XMLBlueprint you'll notice yellow, green, and blue lines appearing on the left side of the margin. This makes it easier to keep track of the changes in your document. • Green lines indicate that text to the right of that color has been edited before the last time you saved your document. • Yellow lines indicate that text has been changed after the last time you saved your document. • Blue lines indicate that text been changed during the last edit operation. To simplify working with large XML Documents, XMLBlueprint provides XML Folding. The XML Navigation Bar shows the XML hierarchy of the current node. You can use the XML Navigation Bar to quickly navigate to an ancestor of the current node. 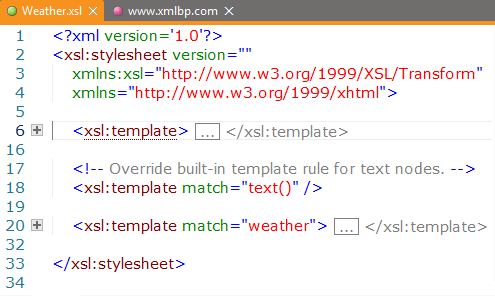 Click on 'xsl:template' to select that element in the XML Editor. To see the hyperlinks in a document, press and hold the CTRL key, move the mousecursor. To open a hyperlink (e.g., a hyperlink to a DTD, or XML Schema) in another editor within XMLBlueprint, press and hold the CTRL key and click the left mouse button on the hyperlink (CTRL+CLICK). To open the hyperlink in another application, press and hold the CTRL key and the SHIFT KEY and click the left mouse button on the hyperlink (CTRL+SHIFT+CLICK). • Click XML > Go To Begin Of Element (or CTRL+[) to move the caret to the begin of the current XML element. • Click XML > Go To End Of Element (or CTRL+]) to move the caret to the end of the current XML element. • Click XML > Select Element (or CTRL+E) to select the current element in the XML Editor. • Click Schema > Go To DTD to open the DTD that is found in the active XML Document. • Click Schema > Go To Schematron Schema to open any Schematron Schema that is found in the active XML Document. • Click Schema > Go To Relax NG Schema to open any Relax NG Schema that is found in the active XML Document. • Click Schema > Go To to XML Schema to open any XML Schema that is found in the active XML Document.